I do realize it’s a stretch for a property with a usable outdoor space of less than .1 acres to be called a homestead, but it’s all about what you do with what you have, isn’t it? What we have, even with its limitations, is pretty enjoyable, with the potential to become awesome. Right now, for example, there are many projects and lives in their infancy around our place. Babies of all sorts, if you will! Per the request of a reader, I thought I would share photos of a few of them. 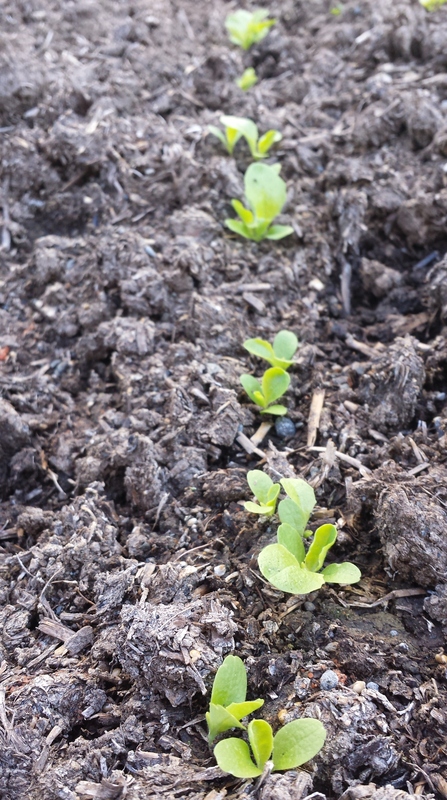 Above you’ll see the little butter lettuce starts that, so long ago when I planted them, I doubted would ever sprout. Lo and behold, sprout they did! Those are baby snap pea shoots. 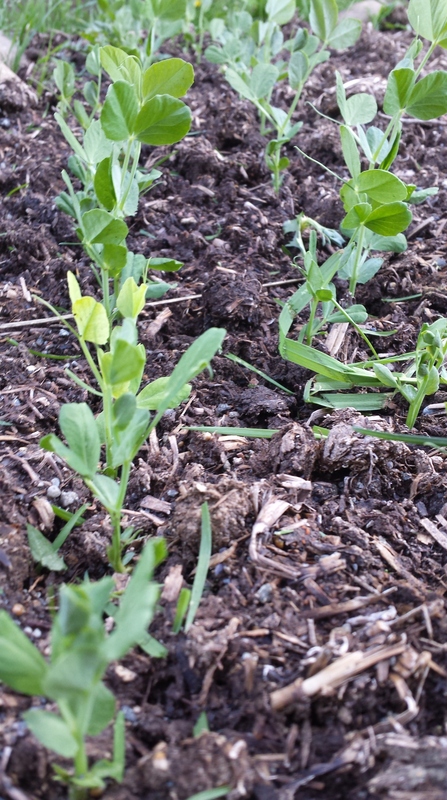 Next to them, out of the photo, I’ve planted baby shelling peas. I didn’t like peas growing up, but then I signed up for my first CSA in northern California, and received a couple of pounds of them against my will. Between the bonding time Joseph and I spent shelling peas together while watching Mad Men, the recipe for sauteed peas with butter and sour cream my coworker Jenny shared with me, and the fresh-from-the-vine taste… well, I’ve been a friend of peas ever since. 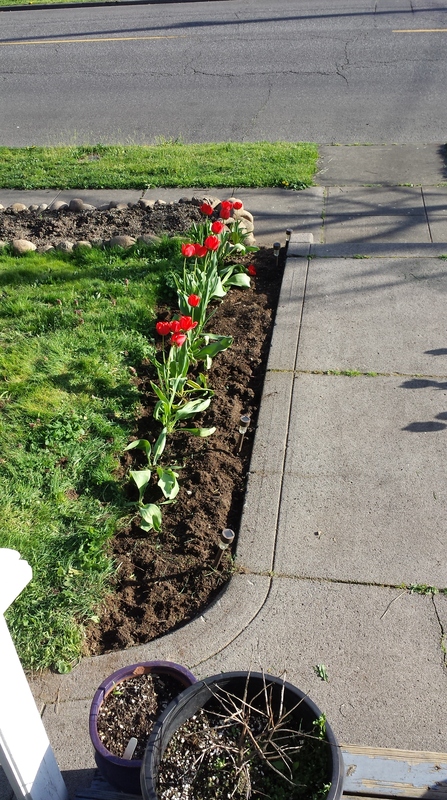 I’m thankful for whoever planted the tulips along our front walk before we moved in. You’re a good person, you stranger. Tulips in the spring + tomatoes in the summer = rosy enjoyment for months. This isn’t the best picture. 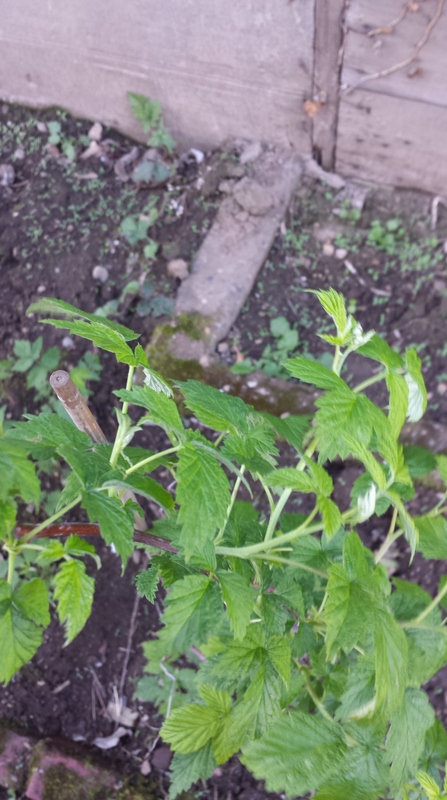 I couldn’t get the raspberry canes to cooperate, but there are buds on these here plants. Buds! Which mean raspberries! Which mean jam! Special thanks to my grandma for letting me dig up some starts from her always-prolific raspberry patch last year. My love for garlic is no secret, and it gives me a little thrill to look at these healthy plants, and know that in July, I’ll harvest many months’ worth of garlic to store and enjoy in many different capacities. 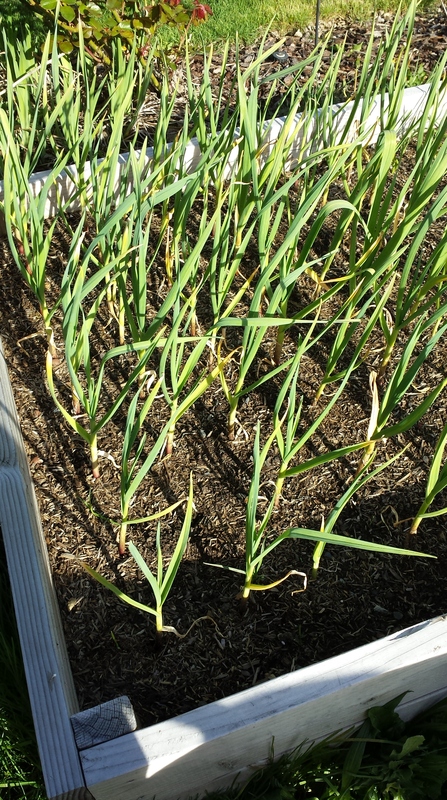 I have this 4-x-4 bed full of garlic that was planted last October, plus another identical bed about half full of garlic, with the other half taken up with shallots and leeks. This is my first year doing a potato tower. 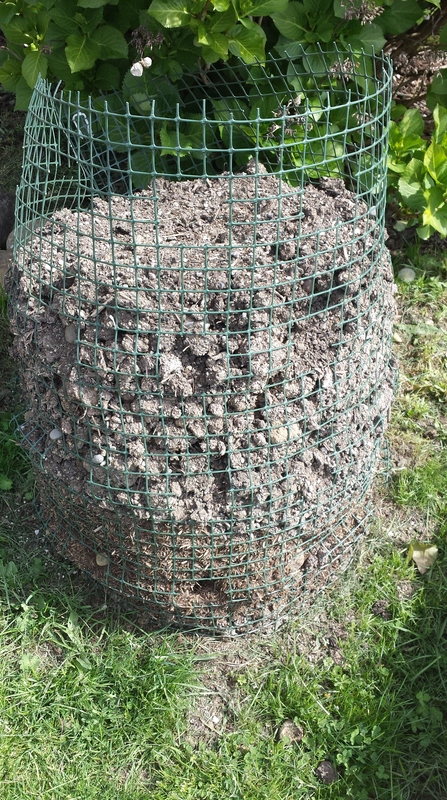 I tied together some plastic mesh material and nearly filled it with mushroom compost and fresh soil. I poked seed potatoes at regular intervals into the sides. What’s supposed to happen is that soon, with enough regular watering (shouldn’t be a problem here in rain-land, hey-oh!) the potatoes will sprout, greenery will abound, and soon I will have my first new potatoes to dig, for a total season’s yield (in early fall) of around 30 pounds. We shall see. I’m fairly excited, too, about these additions to my herb and flower garden. In the front are bleeding heart starts from my mom, which I’ll plant soon, when I turn the parking strip in front of my house into an oasis for flowers. In the picture, there’s a bay laurel start behind the bleeding heart plants. I was instructed by the herb lady at the market to keep that one in a pot for the first two years and let it grow up a bit before transplanting into the garden. I know bay leaves grow very well in northern California, and while I haven’t done the research, I imagine the very different climate here in Portland makes this little plant a little sensitive. The other herbs are English thyme (because I can’t get enough thyme), a dwarf variety of rosemary (because I couldn’t possibly keep up with the size of a regular rosemary plant in my little ol’ garden – have you seen those things? 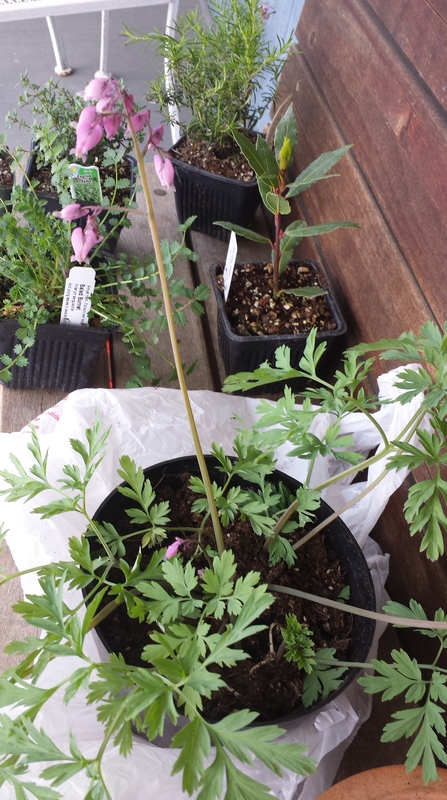 ), and a salad burnet plant. Salad burnet is a hidden gem in the herb world. It’s got pretty, fluttery leaves that taste like cucumber, making it ideal for an infused vinegar or salad dressing. It’s one of those plants that’s so rare in the stores, it just makes sense to take up a square foot in your garden for those few special mealtimes when you might be hankering for a taste. Enough geeking out on herbs. Let’s get some protein up in here. Don’t be sad. By protein, I meant eggs. These sweet girlies are my first ever laying flock! 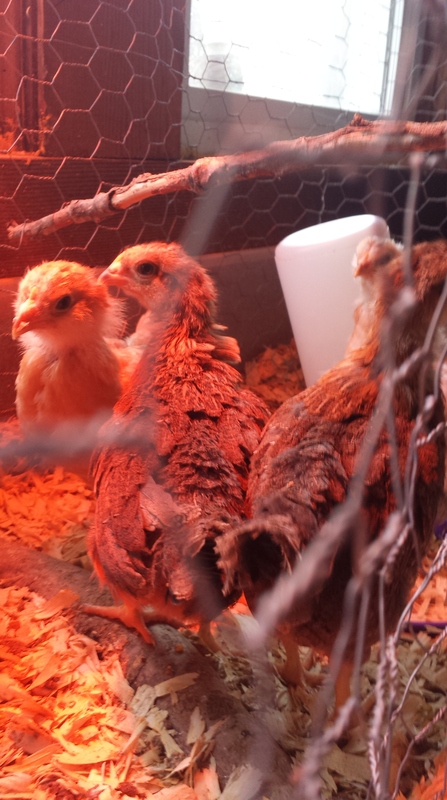 I can’t wait until they get big enough to move outdoors to run around in the new chicken run – which is still a work in progress. They are pretty cute, and though they are also perpetually hungry and messy and stinky and refused to pose for this picture, I still love them. The brown ones (Welsummers) are Monty and Rabbit, and the other one is Tramp. I think. She has three other sisters that are fairly identical to her, and they’re all growing so fast it’s tough to tell them apart. My original baby, Daisy the labradane. 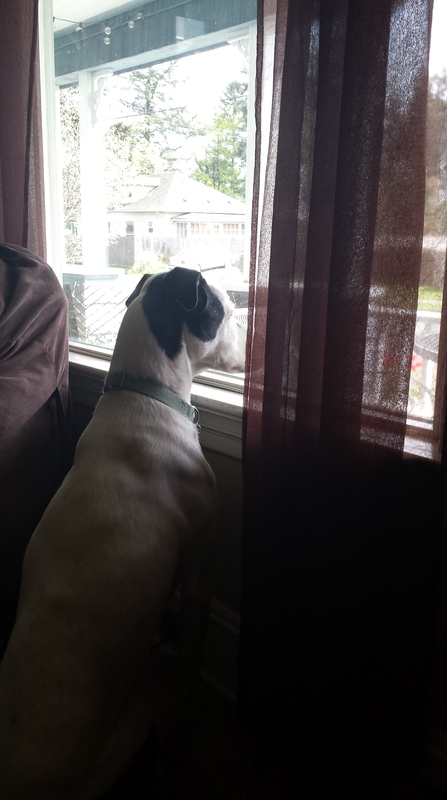 She’s on squirrel patrol. It’s serious business. 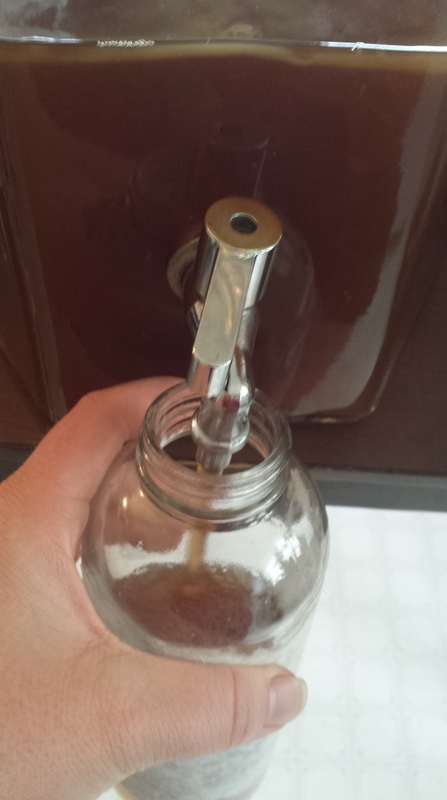 Kombucha: we try to brew this nectar of the gods and keep it on tap. If you don’t know about kombucha, check out this post by Kristen at Food Renegade, one of my favorite blogs. She’s a great resource for kombucha tips and other things fermented. There are always various foods fermenting at my house; if you don’t already know, it’s just incredible what naturally fermented foods can do for your digestive health, and your health overall. Our ancestors ate fermented food every day, and digestive disorders weren’t nearly as much of a threat to them as they are to Americans today. Digestive disorders were also a much smaller threat to them than mastodon attacks. Let’s finish up with some more plant babies, shall we? 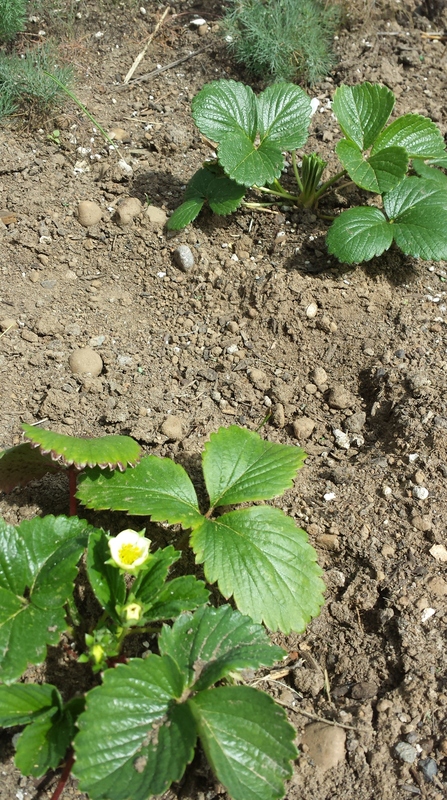 This baby strawberry patch, guarded by a baby army of dill, looks a bit sparse right now, but should spread its seed far and wide by this time next year. There is nothing – and I mean nothing – like a Hood strawberry. If you live around here and can get your hands on some Hood strawberries when they come into season, by all means, drop everything and do it. If you’re not from around here, you should probably just move. You need to experience these juicy wonders. Last: this is not a baby. It’s more like an elderly lady. 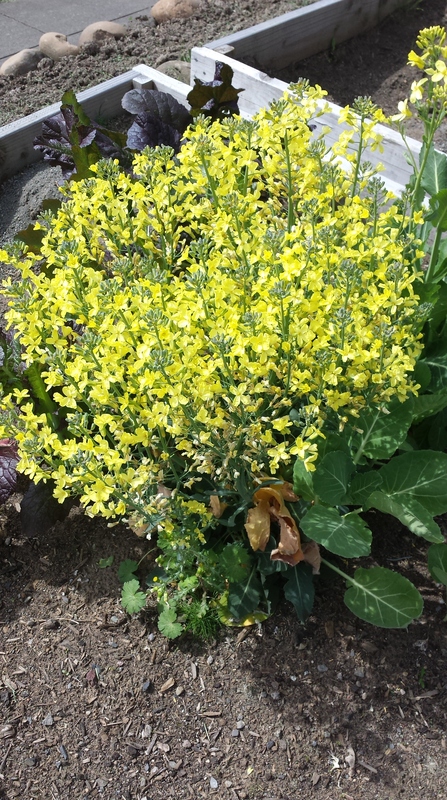 It’s a broccoli plant whose florets I did not pick. It flowered and flowered and will go to seed soon. I may try my hand at seed-saving with this broccoli, before I uproot it and make room for the squash and cucumbers, eggplants and beans I’m going to plant over the next couple of months. Thanks for letting me show you all the little things I’m proud of right now. Merry springtime to all. 14 Apr	This entry was published on April 14, 2014 at 10:52 pm and is filed under Collection. Bookmark the permalink. Follow any comments here with the RSS feed for this post.